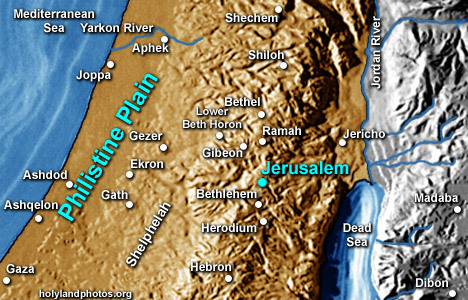 The “Philistine Plain” is the area in Israel located south of the Nahal Yarkon and north of the Nahal Besor—located south of Gaza. It is bounded on the west by the Mediterranean Sea and on the east by the Shephelah. It is about 50 mi. [80 km.] long and varies in width from 10 mi. [16 km.] in the north to 25 mi. [40 km.] in the south. The great trunk route that connected Egypt to Damascus and Mesopotamia ran through this area--from Gaza to Aphek and to points farther northeast. It is named after the people group, the Philistines that settled there, ca. 1180/1130 B.C. Its major cities included, from north to south, Joppa, Ekron, Gath, Ashdod, Ashqelon and Gaza. Philistia is mentioned 7 times in the Old Testament while Philistine(s) occurs 276 times.